Smells like a malt from Campbeltown, tastes like one from the Highlands. 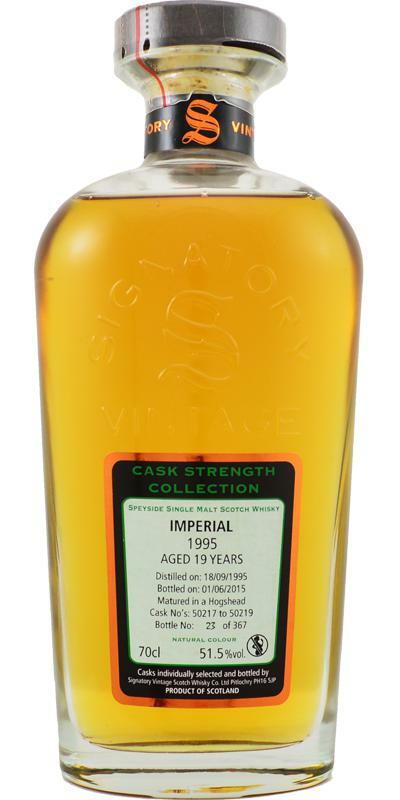 And it is: An Imperial from the Speyside. A real chameleon. And really good. A mineral and earthy nose. Salt and pepper mixed with honey. Over time, bright fruits come towards apple. Something pear sauce. The spiciness is nice and intense, without becoming too dominant. Time and again, the mineral impression flashes on, like wet pebbles. Over time, a fine malt note and some cocoa powder. Remains long constant and consistently intense. Strong start with almonds, marzipan bread, caramel and oranges. Dry and with some wood from the beginning. Slightly peppery. Dark chocolate and a few mild herbs are added. The almonds and oranges are very present. (A lot) honey and vanilla. Cafe au lait. Yeast dough. On the tongue, the malt makes a "dense" impression, so the flavors are all pretty close to each other and do not fray. Unlike in the nose, I no longer have the mineral note on my tongue. Medium long, dry and spicy. Wood. Slightly peppery. Almonds and marzipan still. Bright fruits. Red berries. Oily texture. Spicy. Slightly bitter Oranges. Still very fruity, and even a bit waxy now. Medium - long. A tad dry and bitter, in addition to the default fruityness in this dram. Still a bit waxy. Feels a bit more balanced on last few sips. Fruity, a lot of nuts, pears, crème brûlée or popcorn - peaches - nectarines - mango-kiwi - orange - tangerines and grated coconut. Alcohol well integrated, tart - fruity something like Haribo Goldbären and some plywood crackles on the tongue. The Bourbon Hogsheads ripening leaves much left of the distillery. No high-flyers, but worth a try. Unfortunately, the nose had noticeable flaws, the taste has got it out a bit, shows the typical Bourbon Imperial notes in good shape.